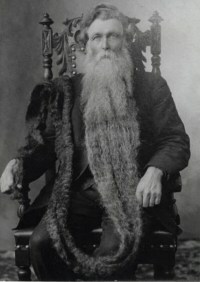 Hans Nilsen Langseth was nicknamed "King Whiskers" for holding the record for the world's longest beard, 18 feet and 6 inches long. He used to roll it up and tuck it into his coat or vest, which hid much of it. This is a portrait of Hans Nilsen Langseth, aged 68.
his beard draped over his shoulder and down again. Mr. Langseth was born on July 14, 1846, in Norway to Nils Olsen Langseth and Marthe Gulbrandsen Overholtet. Like at least 3 of his brothers, Mr. Langset made his way to the USA. With his wife Anne Benson he had 6 children. Mr. Langseth spent much of his life as a farmer. For a while, however, he traveled with a circus show, exhibiting his beard to the public, but he soon tired of people yanking his whiskers to see if they were real. Hans (to the right) with his children Pete, John, Emma, Martin and Nels. 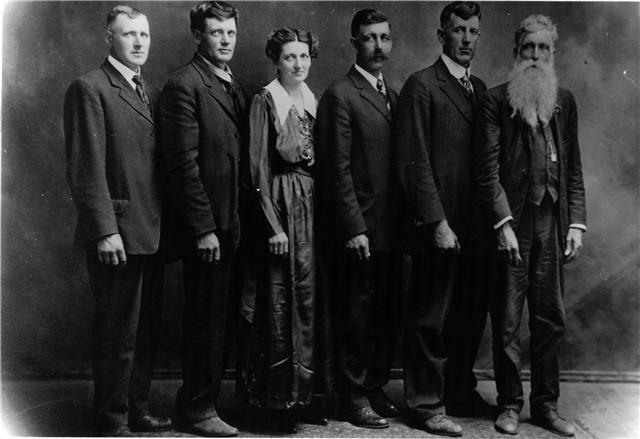 When Mr. Langseth passed away on November 10, 1927, one of his children - to the displeasure of his other siblings - cut his father's beard. It is preserved in the Smithsonian at Washingon, D.C.
See also: HansLangseth.com, The World's Longest Beards, GuinnessWorldRecords.com.